Our flight from Beijing arrived midday and we checked in to The Blue Sky hotel. We spent over 30 minutes in a queue in the bank to change some money. (visitors are not allowed to bring in or take out Mongolian togrog currency from Mongolia). We wandered around Sukhbaatar Square, named after the revolutionary hero of 1921, Damdiny Sukhbaatar who declared independence from China, and Genghis Khan Square. Along one end of the square is the Parliament building. 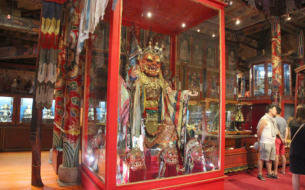 We visited the Choijin Lama Temple Museum. We returned to Ulaanbaatar for another day between our trips to the Gobi Desert and Lake Khovsgol and visited the Winter Palace, Zaisan Memorial, Gandan Monastery and the National Museum. Ulaanbaatar, meaning “Red Hero”, was so named in 1924, following the creation of the Mongolian People’s Republic. 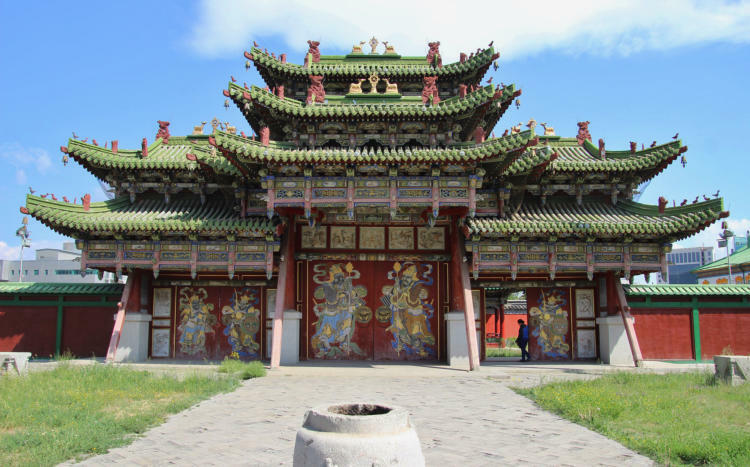 The city was founded in 1639 as a moveable Buddhist monastic centre but in 1778 it settled permanently at its present location on the Tuul River in the north-eastern central Mongolia. The Buddhist temples now co-exist with the increasing number of skyscraper towers. The city is at an elevation of about 1,310 metres (4,300 ft) and is home to almost half of the country's 2.7m population. We saw an immense amount of high rise construction work taking place. Choijin Lama Temple Museum is a very interesting, old, authentic Buddhist temple in the city centre, sadly surrounded by high rise office blocks and a hotel. 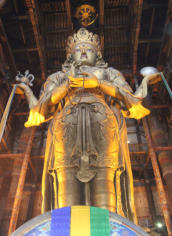 With so many artefacts, the five temples are more like a museum. It houses many of the relics from Luvsan Haidav Choijin Lama (‘Choijin’ is an honorary title given to some monks), the state oracle and brother of the Bogd Khan. There is a small entry charge and, as with many sites, you have to pay to take photos (a very high charge). I fully recommend a visit. 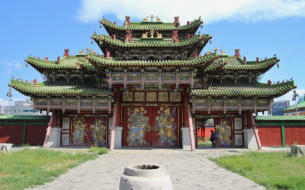 The Winter Palace of the Bogd Khan was built between 1893 and 1903. The palace is the only one left from originally four residences of the 8th Jebtsun - damba Khutughtu, the Bogd Khan. The palace was spared destruction by the Russians and turned into a museum. 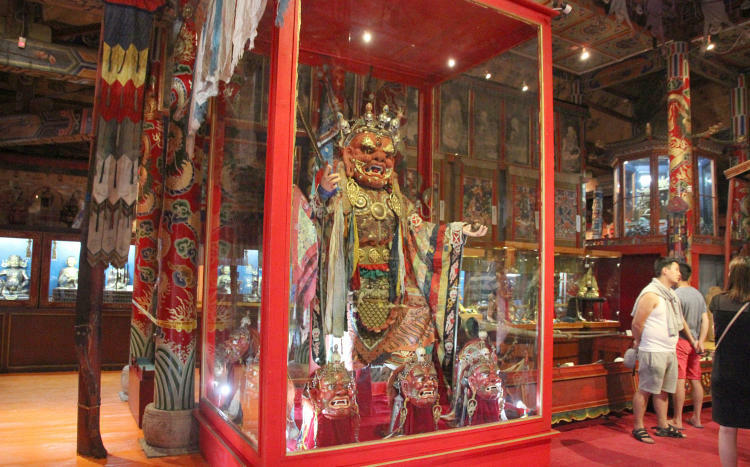 On display are many of the Bogd Khan's possessions, such as his throne, bed, his collection of art and stuffed animals, his ornate ceremonial ger lined with the skins of 150 snow leopards, and a pair of ceremonial boots given to the Khan by Russian Tsar Nicholas II. The Zaisan Memorial, a tall, thin landmark on a hillside, it offers the best views of Ulaanbaatar and the surrounding hills and the Tuul River. 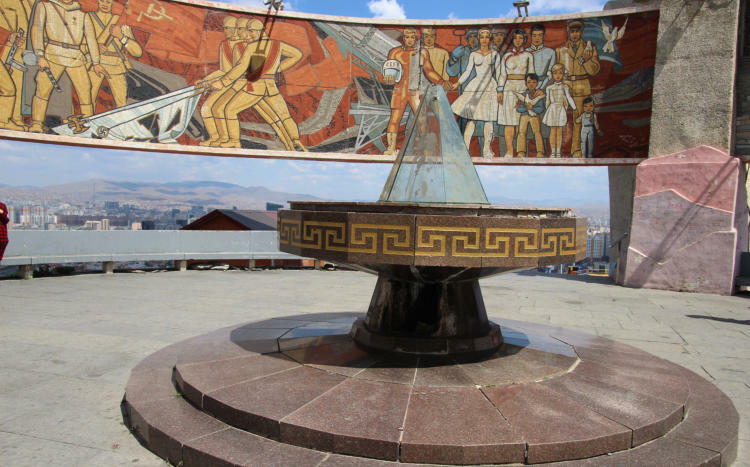 Built by the Russians to commemorate ‘unknown soldiers and heroes’ from various wars, the memorial features a circular memorial mosaic / painting depicting scenes of friendship between the people of the USSR and Mongolia. The enormous tank at the bottom of the hill was part of the Mongolia People's Tank Brigade that saw action against the Nazis during WWII. Classic soviet style artwork. There are about 200 steps to get to the top so it’s not for everyone, but the climb is worth it to see the incredible mosaics at the top. 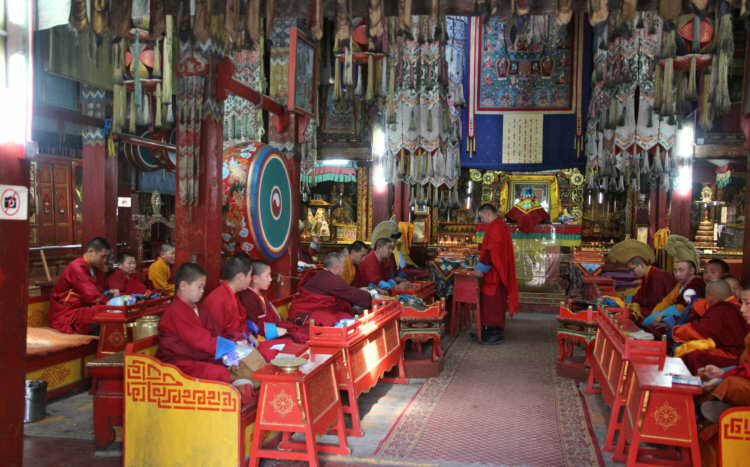 Gandan Monastery is much like a monastery village as a few roads run throughout it. It has some beautiful chapels and courtyards. We went into the temples, some of which we saw the monks during their chant ceremonies. In the Tibetan style temple, Mijig Janraisig, we saw its huge 75 foot golden buddha statue, which is surrounded by brass prayer wheels and 1008 miniature longevity deities. 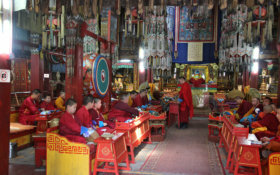 Gandantegchinlen Khiid is a Tibetan-style monastery is the largest and most revered functioning monastery in Mongolia. It was constructed by the order of Emperor Yongzheng in 1727. It was one of the few monasteries to escape the soviet purges of the 1930's, being spared as an example of Mongolia's feudal past. Since the fall of communism in 1990 it has been renovated and restored into a working monastery and currently has over 150 monks in residence. 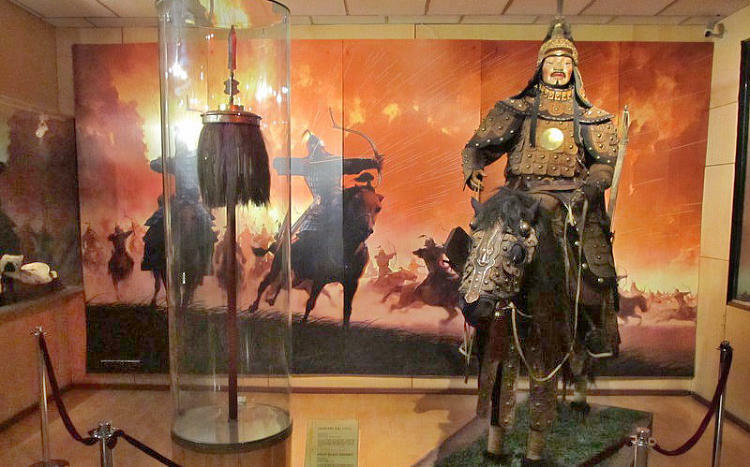 The National History Museum gives a great insight into Mongolian history Laid out on 2 floors, it has some really interesting exhibits. It goes from the Stone Age to the present with many artefacts giving a great insight into the Mongo - lian culture and influences of other cultures. The costume section is really impressive. I found the first floor too hot and uncomfortable so, unfortunately, had to rush the end of my tour. You can take photos on the ground floor but not on the first floor. A must visit place in Ulaanbaatar.